Kwetsani Camp is a five roomed luxury tented camp located in a private reserve 25km to the west of Mombo and to the west of the Moremi Game Reserve. The large elongated island on which Kwetsani is built is heavily wooded, cool and shady with Palm, Mangosteen and Fig trees and is one of the most remote camps in the entire Okavango Delta. Kwetsani Camp is raised on stilts beneath a shady canopy. Five wonder rful, spacious tree-house chalets are built under thatch roofs, with wood, glass and a little canvas. All have en-suite facilities including a shower, flush toilet, twin basins and an additional outdoor shower for those who like showering in the open air. The camp overlooks an enormous floodplain dotted with Lechwe and Wildebeest. Guests can lie in their rooms, or in the pool, and watch the animals in front of the camp. All the Okavango's large predators are found here. Activities include mokoro trips, walking on palm-fringed islands and game drives during the day and night. Due to high flood water levels, the night drives are currently restricted to an hour's drive around the camp island. In the height of the Okavango's annual floods, boats are used to get around the area and also to transfer to the islands where the game viewing vehicles are located. Lion, Leopard, Cheetah, Wild Dog, Buffalo and Elephant are all found in this area, as well as good concentrations of Zebra, Wildebeest, Giraffe, and all the plains game. Access into this area is only by aircraft (depending on the Okavango's flood levels, either Jao or Hunda airstrip is used for access to this camp). Hippo, Sitatunga antelope and Crocodile reside in the deeper permanent lily-filled lagoons of the area. 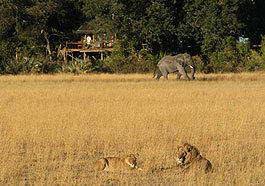 Lion, Leopard, Wild Dog, Cheetah, Tsessebe and Lechwe are among the major game attractions at Kwetsani. Nocturnal animals such as Porcupine, Aardwolf, Cerval, Genet and Bushbaby can be observed on the night drives (water levels permitting).